Arthur A. Levine Books, 9780439640114, 40pp. "Once upon a time" takes on a whole new meaning in David LaRochelle's hilarious backwards collaboration with Caldecott winner Richard Egielski. ..".And they lived happily ever after." 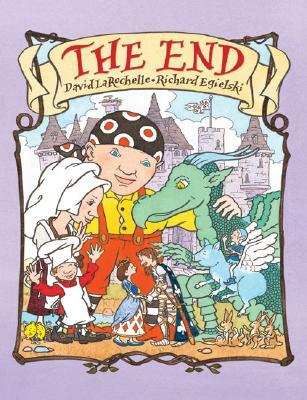 So begins David LaRochelle and Richard Egielski's wacky original fairy tale THE END, which traces the courtship of a handsome knight and a beautiful princess . . . backwards Before you reach the beginning, you'll meet a temperamental giant, a beleaguered cook, a dragon who's scared of bunny rabbits, an oversized tomato, and an impish figure on a flying pig who just might be the cause of all the madness. It's a conventionally perfect and perfectly unconventional take on the fairy tale -- guaranteed to convert the Grimmest reader to giggles. David LaRochelle, a former elementary school teacher, is the author and illustrator of numerous picture books, including The Best Pet of All, a Children's Book Sense Top Ten selection and one of Child Magazine's Best Books of 2004. His latest book, Absolutely, Positively Not, is his first novel. It is the humorous look at the life of Steven DeNarski, a sixteen-year-old boy who doesn't know whether he will pass his driver's test or if he'll ever understand his parents. But there is one thing Steven knows for sure: He is absolutely, positively NOT gay. David has also published puzzle books and books of family activities. His work has appeared in Cricket, Spider, and Cicada magazines. He illustrates the nationally syndicated newspaper column, Donna's Day. When David is not writing, illustrating, or visiting schools as the author/illustrator-in-residence, he enjoys going to theater, entering contests, and orienteering. He also loves to carve pumpkins and his creations have been featured for several years on Good Morning America. David LaRochelle lives in White Bear Lake, Minnesota. Richard Egielski received the 1987 Caldecott Medal for HEY, AL, story by Arthur Yorinks, and he has also illustrated texts by Pam Conrad, Margie Palatini, David LaRochelle, and Jonah Winter. The books he has both written and illustrated include BUZ and JAZPER, both named Best Illustrated Children's Books of the year by The New York Times.